The 14 new buses represent a £3.3m investment. 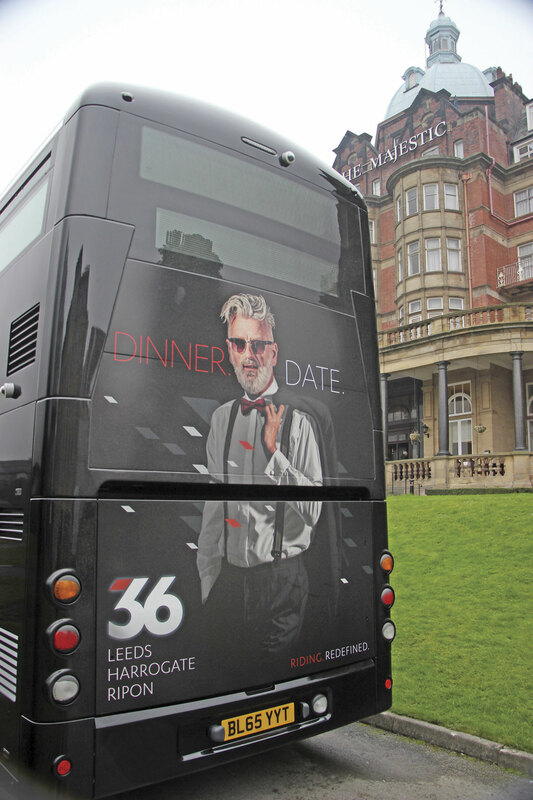 In 2003 Giles Fearnley, Stuart Wilde and the team at what was then the Harrogate & District operation of Blazefield Holdings relaunched the 36 service between Leeds, Harrogate and Ripon in a revolutionary move that started an immensely positive trend in the industry. 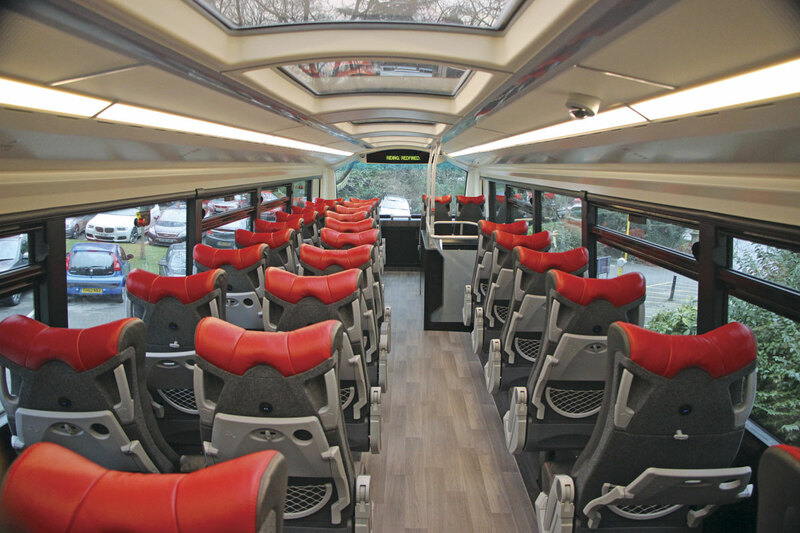 The introduction of leather seats in dedicated branded high specification buses set a standard that was further enhanced with an extensive in-house mid-life refresh and re-brand in 2010 that brought with it free on-board wi-fi and 2+1 upper deck seating. 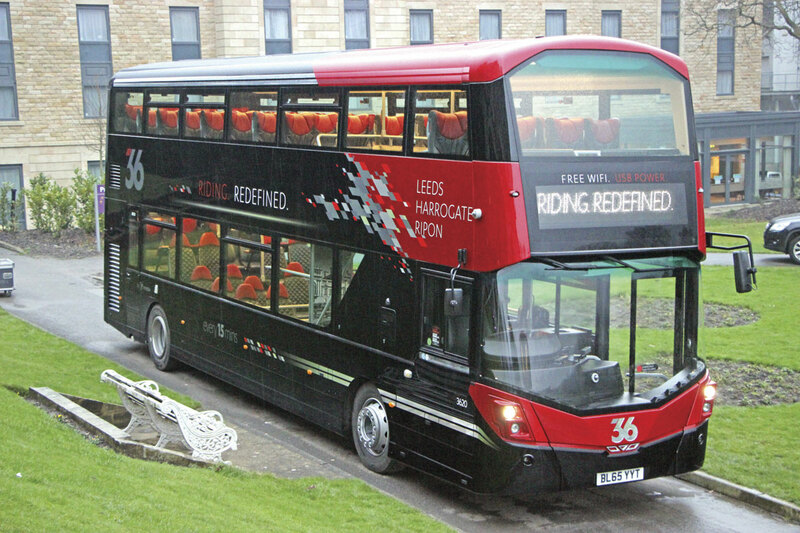 Today, the operation is the Transdev Harrogate business of Transdev Blazefield where Chief Executive Officer, Alex Hornby, has now been at the helm for a year. The 36 has consistently returned double figure annual patronage growth with some tailing off in recent years. 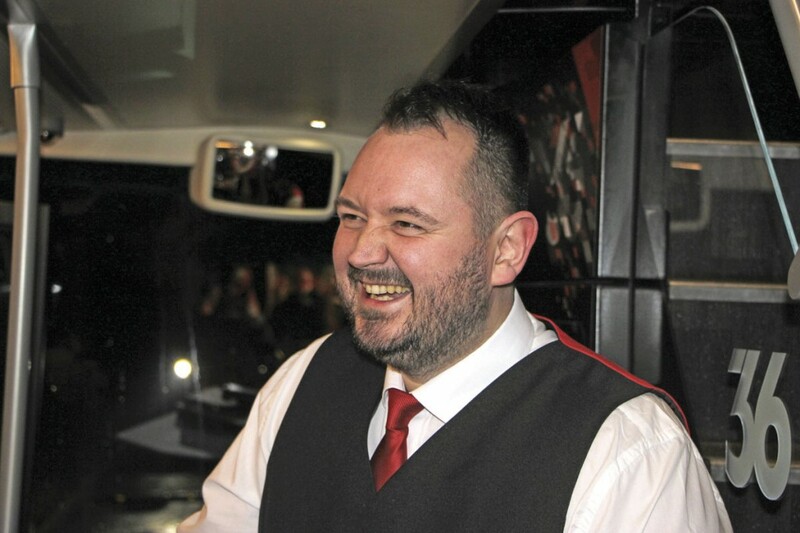 The time had come to take another step forward with it and Alex’s target was quite simply to make it ‘the finest bus route in the country.’ With high specification buses already operating and customer satisfaction figures standing at in excess of 95%, the bar to beat was lofty indeed. The riding experience was to be redefined. Before any decisions were made, customers were asked what they liked about the existing service and what they’d like to see in future in an extensive research exercise that looked at ‘every detail of the journey experience’. The key element revealed by this research was that customers wanted their own space, although an interesting additional finding was that they like exchanging books on the journey. Armed with this knowledge, the company set about drawing up the new specification, working closely with the manufacturers and suppliers to establish what could be achieved. Last Thursday night the results of that collaboration were revealed when the new vehicles were introduced to invited VIPs, including regular passengers, in an appropriately high profile launch event at the Majestic Hotel in Harrogate, a venue I remember fondly from a CPT Annual Conference many years ago at which Brian Souter gave a rendition of ‘The Teddy Bear’s Picnic’. Attendees included the Mayor of Ripon, Cllr Pauline McHardy along with her deputy; the Mayor of Harrogate, Cllr Nigel Simms, representatives of a number of local councils, several passengers, suppliers and the press. Transport Minister, Andrew Jones, who is also the local MP, was scheduled to attend but was unable to do so, though he did visit the depot the following morning and inspected one of the new buses. Stuart Wilde was there too, delighted to have been invited to see where the project he started was going next. Welcoming everyone were members of the Transdev Harrogate driving, office, cleaning, maintenance and management disciplines, all smartly attired in the new uniforms introduced to coincide with the changes. 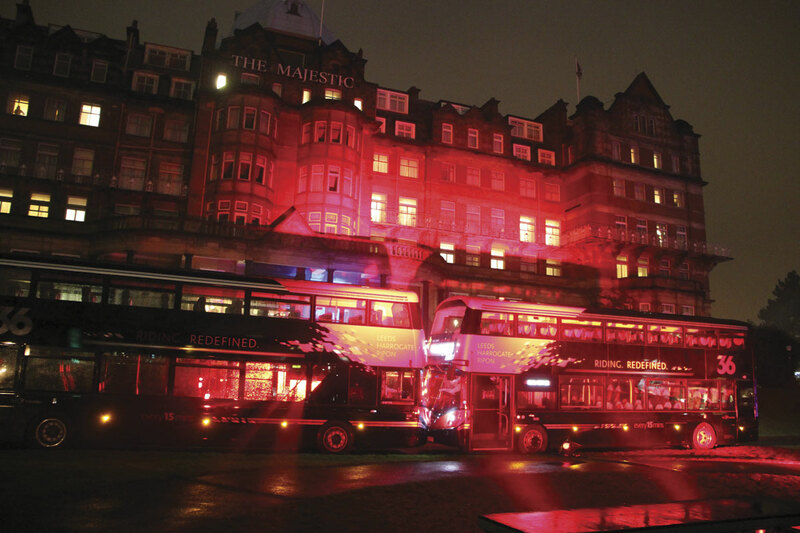 After a speech from Alex Hornby, people went outside where, fortunately, the rain had stopped, to witness two of the buses featuring in a light show against the backdrop of the hotel frontage culminating in fireworks. Afterwards there was the opportunity to take a short ride on one of the buses. The £3.3m investment has gone into 14 new Volvo B5TL buses with Wrightbus Gemini 3 standard height (4.3m) bodies, the interiors of which embody features usually only found on luxury coaches, such as a roof with a near full length glazed centre section, double glazing, luxury leather trimmed seating and wood effect floors. 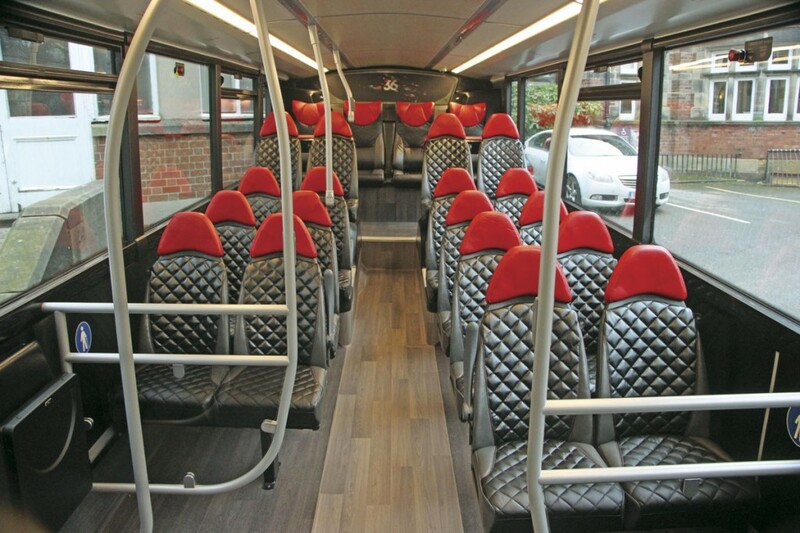 Upstairs, as on the buses they replace, the seating is arranged in a 2+1 layout but the ambience is completely different as these are Esteban EGA leather trimmed coach seats complete with seat back tables and magazine nets. With the glazed ceiling and wood effect floor there is a really luxurious feel to it. At the time of the original launch there had been concerns about whether people would go upstairs but experience has shown that the top deck now fills up quicker than the lower saloon. 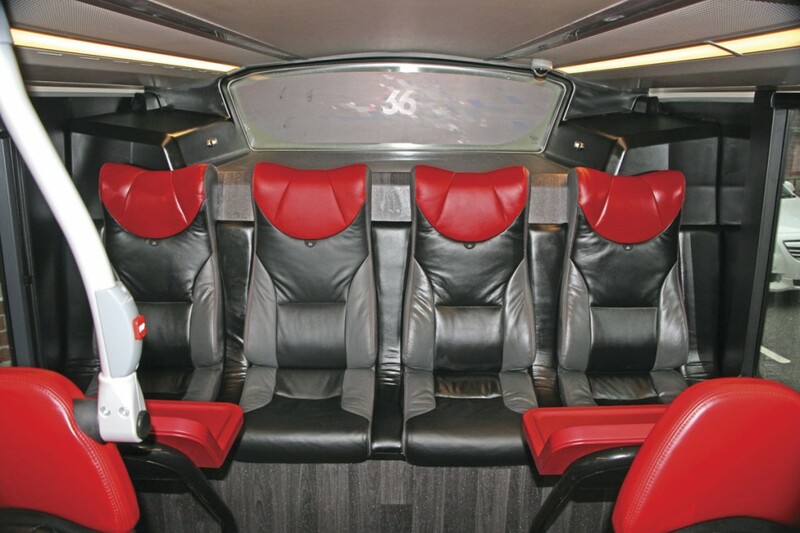 The total capacity is 63 seats, which is two more than the 61 previously provided, despite the greater spaciousness. On the lower deck, the wheelchair bay is on the nearside and the buggy bay on the offside beyond the forward ascending staircase. 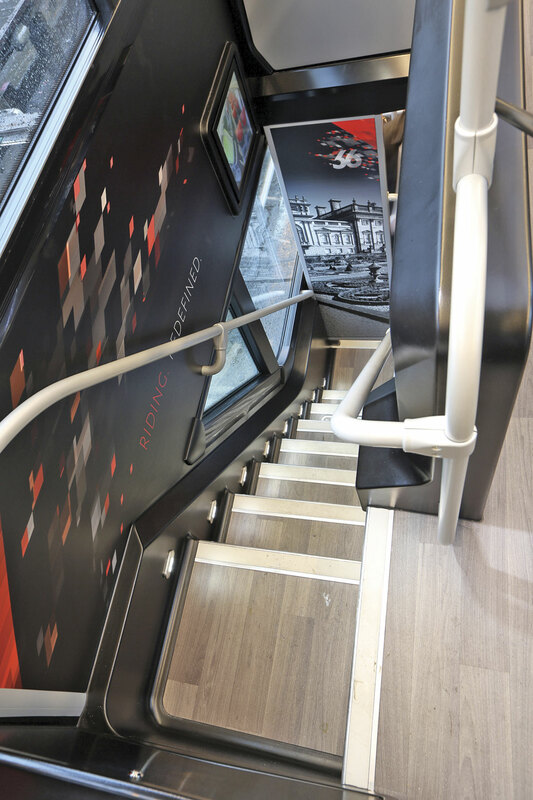 The staircase is worthy of note, not only does the glazed side panel have an illuminated 36 set within its centre, but there is a screen facing you as you go to ascend the stair which shows which seats are available. In addition to lights alongside each step, the stairwell is illuminated by side windows that follow the line of the lower deck glazing. All of this is set off with other touches including glazed staircase windows, a special treatment added to the front screen that helps disperse rain and road dirt to give a consistently clear passenger view and next stop announcements on LED screens on both decks, as well as verbally. The voice for the latter feature is provided by BBC Look North presenter, Harry Gration, which is a great local touch that will be instantly recognisable to users. Something I definitely can see wider applications for is the countdown indicator included within the Mobitec destination display supplied by McKenna Brothers. Believed to be a UK first, the new white Ultima destination blinds are linked with the next stop announcements and scrolling screens on both decks. Operated by the driver, the system counts down from a maximum of ten minutes, initially in whole minutes, but in seconds for the final minute. 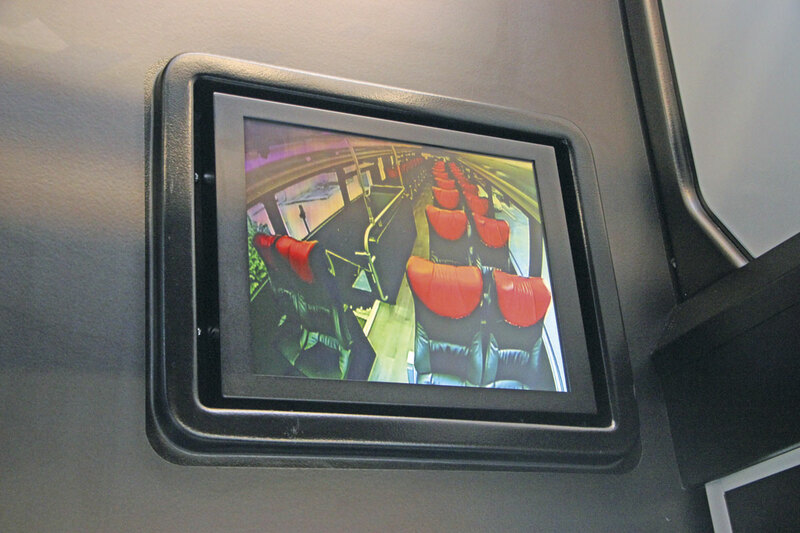 As well as the USB points, each bus has 4G wi-fi mobile access availability, the fastest that could be sourced, supplied by Icomera along with an applications router. 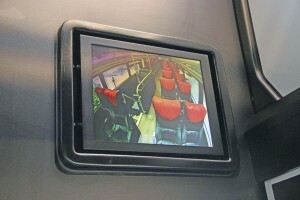 The CCTV system is by Synectics, incorporating no less than 15 cameras. Incidentally, the driver does not miss out on the leather seating, his/her KAB seat unit is also leather trimmed and the cab is provided with an air conditioning unit. Wayfarer ticket equipment is specified. You might not immediately recognise it, because to my mind it looks very different to the many liveries and brands he has been associated with in the past, but working his magic on the vehicle and publicity material was Ray Stenning of Best Impressions who has come up with a more hard edge style that well suits the sharp lines of the latest generation Wrightbus styling. The palette includes the red, black and shades of grey traditionally associated with Harrogate & District and its predecessor, the West Yorkshire Road Car Co. No Stenning design would be complete without good use of the rear to promote potential reasons to use the service to car users, and the absence of a rear lower deck window maximises the opportunity for this. I like the fact that this is a livery that does not compromise to accept third party advertising, as those that do (and I’d cite First Aberdeen’s Platinum in this respect) run the risk of completely losing the classy effect. Would you drive a car covered in third party advertising? Prompted by the research, a new ‘Library 36’ feature was created with a book shelf added above the front wheelarch. 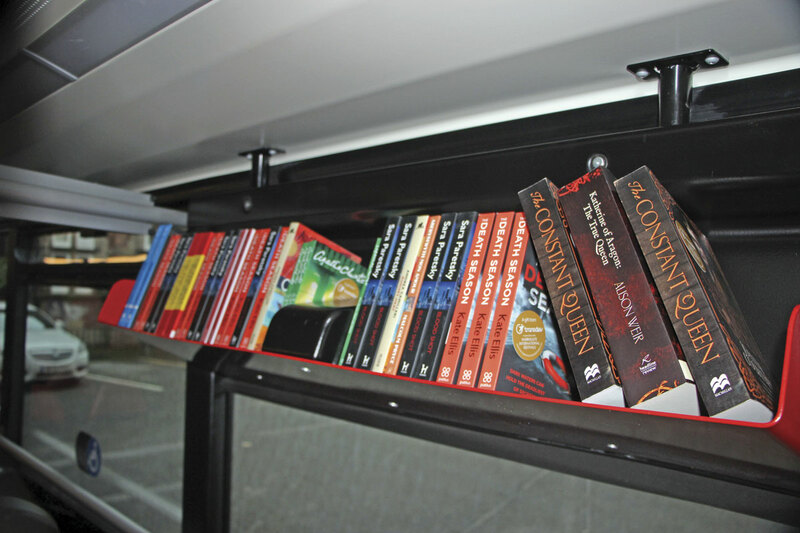 Transdev Harrogate has a long standing partnership with the Harrogate International Festival that in the past has seen books handed to passengers at the bus station. 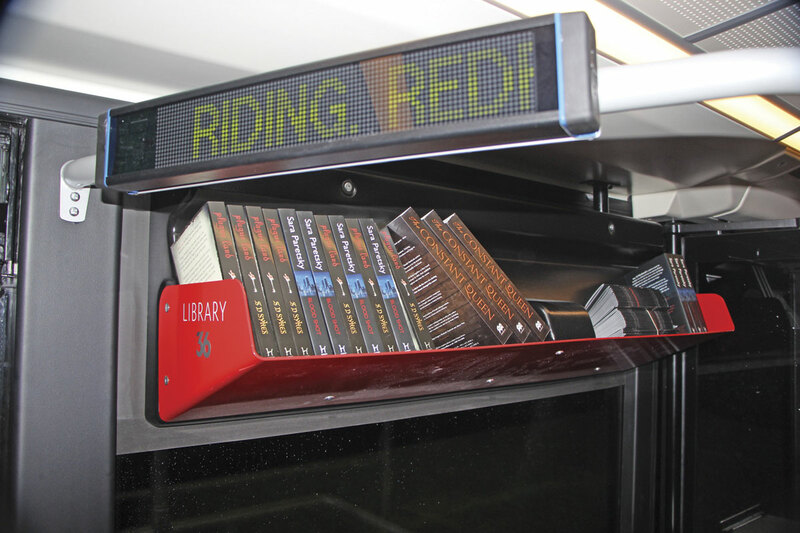 They have provided the initial books to create the library and the intention is that passengers will borrow and exchange books to keep the facility going. It’s the first time I have ever seen such a feature and I wonder what the scope is for wider adoption of this. You’d need a lot of faith in the calibre of your customers. In opting for the Volvo Wrightbus combination Transdev has continued on the path first followed in 2003, though it did not do so without first evaluating the other double deck products currently available. Longer than the previous B7TLs at 11.5m rather than 10.8m and with a 6.3m wheelbase, the chassis are powered by a 5.1-litre D5K Euro6 engine developing 240bhp/918Nm. This is linked to a six-speed ZF Ecolife fully automatic gearbox. The previous vehicles had originally been fitted with five-speed automatic boxes but had been upgraded with six-speed units during the refresh procedure. Alex reports that though the size of the engine sounds small, drivers experienced no negative issues with it on the demanding route during the demonstration period with the company. The Greenroad telematics system is also fitted. Although longer, the complete buses are more than a tonne lighter than those they replace, weighing 11,875kg, rather than 13,041kg. This has to impact positively on their fuel economy. I asked Alex whether he had not been tempted to go for a form of alternative fuelling on such a flagship route. He explained that Transdev’s ultimate aim was to go to full electric and that would be the long term focus. 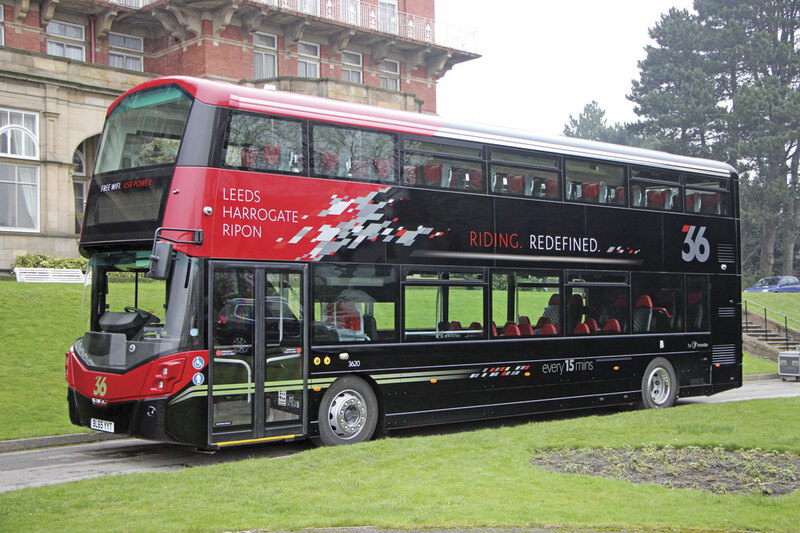 There is an OLEV bid in for ten single deck fully electric buses for use in Harrogate which would join two 100% electric Solos and a fully electric open top double decker that are being operated by Transdev York. Frequency prior to 2003 had been half hourly and this was increased to 20 minutes with the launch of the quality concept and to 15 minutes with the 2010 refresh. That 15 minute, seven day a week, frequency, increasing to every 10 minutes during the peaks, is being retained, but there have been a number of other enhancements introduced to increase the appeal of the 36 to both existing and additional customers. On Friday and Saturday nights, instead of the last bus leaving Leeds at 23.15, there will continue to be services until 03.15. Some peak hour services are now to operate non-stop between Moortown on the Leeds boundary and Leeds Bus Station via Scott Hall Road to give passengers a faster journey. These direct services will involve alternate buses during the peak hour. Furthermore, picking up on the research which revealed that people were using a variety of different ways of getting into Harrogate from its suburbs to catch the 36, including hiring taxis, a number of journeys are being extended into Starbeck, Bilton and Jennyfield to give direct access to Leeds. Rather than confusing other users, these services are listed separately at the rear of the well thought out timetable booklet which includes excellent maps of key locations. The new buses will go into service on Sunday 24 January and with them the revised service provision. Following within weeks will be the availability of contactless ticketing using debit or credit cards for day and week tickets, something Alex believes will complement the already popular mobile ticket app. The company additionally has the Live Times app with more app plans to come. Alex is keen to prove the contactless concept and has plans to extend it in time, providing that it does not create increased boarding time issues. A further ticketing initiative, launched in conjunction with First in Leeds, will enable passengers on the 36 to pay a £1.00 add-on return to their fare giving them entitlement to use First’s Leeds city network. This will enable single fare access to the city’s universities, hospitals, White Rose Shopping Centre and the Elland Road football ground (home of Leeds United). An alternative to offering ultra specifications might have been fares offers but Alex does not believe that fares offers would stimulate the 36 market which prefers quality. Whenever research is done locally, the question of fares does not come up. Furthermore there would be a risk that lowering fares would be seen as cheapening the product. He commented, ‘We wouldn’t have got the growth we’ve got so far by cutting fares,’ though he made it clear that he was not knocking operators who did use fare cutting to encourage growth, because in some places it might be the right thing to do for the local market. 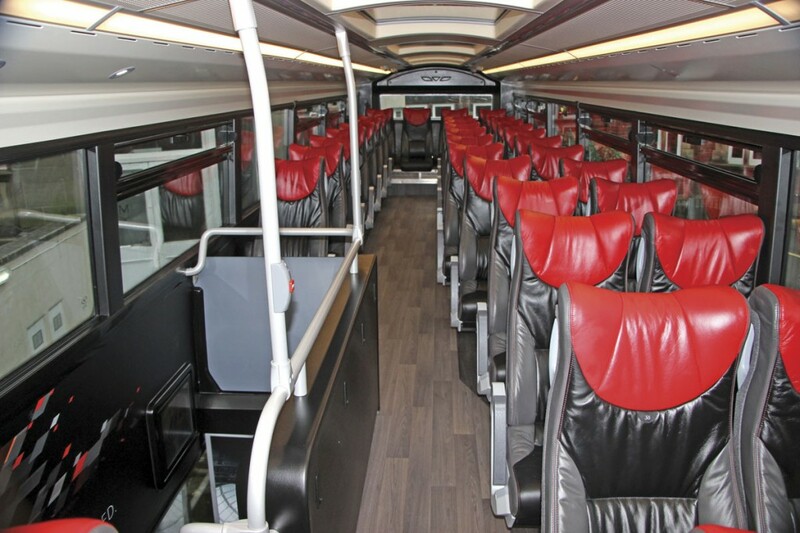 Already two of the existing buses used on the 36 have been repainted and upgraded to provide 4G wi-fi and USB points for passengers to ensure that when a replacement bus is needed the service provided to passengers does not falter. I understand plans will shortly be announced involving ‘quite an exciting new role’ for the rest of the batch once the new buses take to the road. 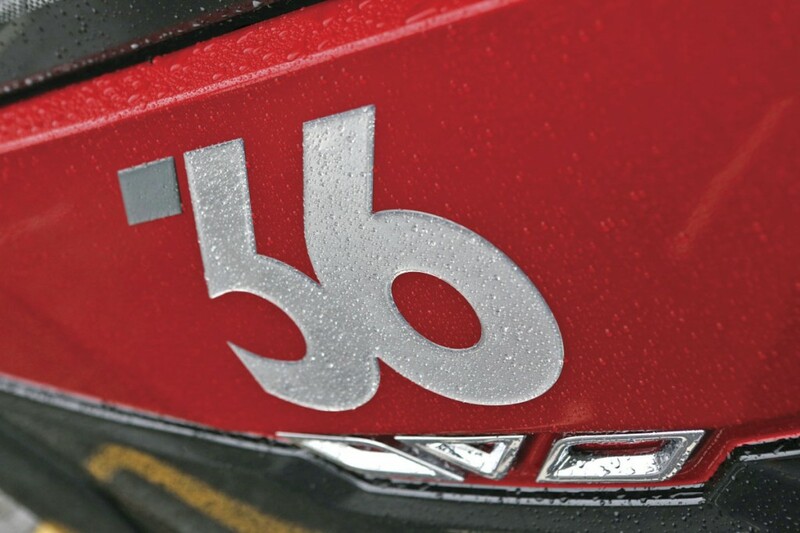 To date, the 36 has not had a dedicated driving roster but one has now been created as part of the relaunch. The 50 strong team was selected as part of a Team Talk 36 programme which saw 18 sessions held, each introduced by one of the directors, either Alex or Managing Director Operations, Russell Revill. ‘We already had a good team anyway,’ said Alex, ‘It was a question of what we could do to improve.’ In total, Transdev Harrogate employs 160 staff running a fleet of 70. Alex is hoping that the investment will see annual growth levels returning to around the 5% mark. He observes that the need to keep improving is always there because the competition is always improving too. He points out that the rail service to Leeds is improving, rail being a main competitor along with the car and staying at home. There have always been advantages over the car in not having to find and pay for parking but with 4G and space to be comfortable on what is a lengthy journey Alex believes there are other marketable advantages. ‘Why choose to sit in your car when you can make more of your time?’ he asks. He says that, ‘staying at home is the competition that people forget about’ but when Blazefield is offering scenic trips to what for many are seen as leisure destinations, the reason to make the journey needs to be as strong as possible and the service as attractive as it can be. There is a significant day out market to and from the three main population centres served, in addition to which Harewood House and Ripley Castle are on the route. It seems almost churlish to criticise with all of this excellent provision, but I have a slight problem with the new 36 logo. At first glance, because the diagonal red section on the three is much darker than the white/grey of the rest of the numbers and it is also slightly separated from the rest of the number, it looks to me as if it says 66 rather than 36 on the bus sides, stop flags and publicity material. I do not know whether this will be an issue for first time users. I mentioned this to Alex who pointed out that it always appears on the front in white but admitted I wasn’t the only person to have said it. He was confident that the strength of the brand and the package would ensure this wasn’t an issue. It’s such a strong total package that it is hard to believe it will have any adverse effect on the route’s continuing growth. 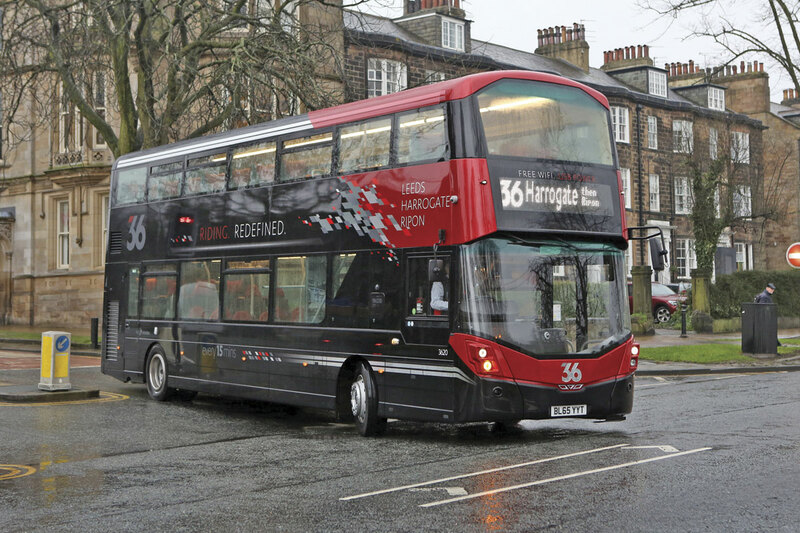 The 36 is by no means Transdev Harrogate’s only route and Alex promised there was much more to come, both locally and elsewhere in Transdev Blazefield. Across Transdev Blazefield (which operates 400 vehicles) a total of 53 new buses are expected to enter service this year. In addition to those on the 36, these will include eleven more double deckers and 28 yet to be announced single deckers. In addition, Alex confirmed that, ‘we will refurbish at least 40 existing buses.’ All of these buses will be used on specific branded routes. I’ve a feeling I’ll be paying a return visit in the not too distant future.